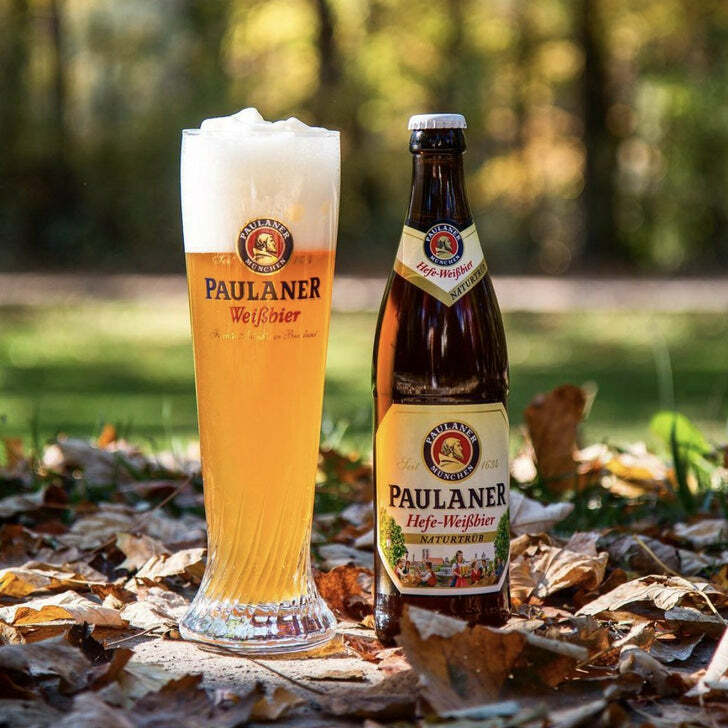 A pale, spicy, fruity, refreshing wheat-based German ale. 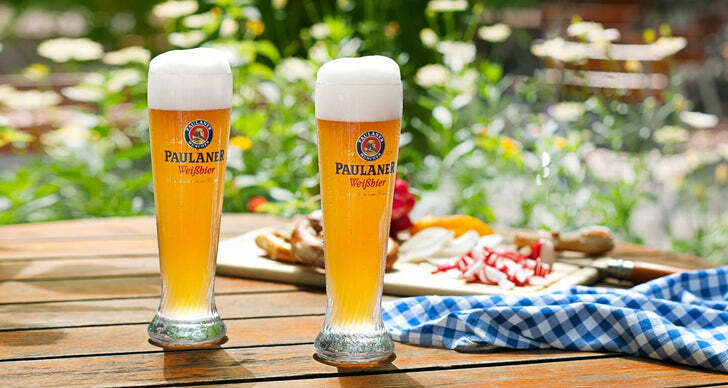 Germans prefer to call the brew Weissbier (pronounced "vice-beer"), while North Americans prefer the term Hefeweizen (pronounced "hay-fuh-veyt-sssenn"). "Hefe" means yeast, and "Weizen" means wheat, so Hefeweizen is "yeast wheat". Weissbier is golden yellow in color and so much lighter than the typically dark German ales that it came to be called “white beer”. Weissbier contain around 5% of alcohol by volume, and lightly hopped. The beer is cloudy as it is unfiltered and uses a yeast that stays readily in suspension. Using the right yeast is key to brewing this correctly as it is the yeast that gives the beer its unique banana/clove character. Fermented warmer the taste pushes towards banana, fermented cooler and the taste leans towards clove. The yeast I use is Wyeast 3068 Weihenstephan Weizen liquid yeast. I have not tried White Labs WLP300 Hefeweizen liquid yeast but it's supposed to be very similar (though most brewers I talk to prefer Wyeast 3068 for this style). I had high hopes for the new Fermentis Safbrew WB-06 dry yeast as it is so much easier to use dry yeast and I get excellent results with their Safale US-05 and Saflager W-34/70 strains. No such luck with WB-06. It's nowhere near as good as Wyeast 3068 after doing a split batch comparison. While WB-06 had some of the banana/clove character, it wasn't as vibrant or rich. It tasted (for lack of better words) "fake". Sort of like comparing real freshly squeezed orange juice to Tang. (They both have an orange flavour, but one doesn't taste real). Heed the warning about headspace. You'll need a lot of room in your fermenter as it develops a sustantial krauzen (foam) during the first few days of fermentation. A blow-off tube is recommended as well. Jamil Zainasheff gives some good advice on fermentation temperature for Wyeast 3068 from his Brewing Classic Styles book which I follow: Ferment at 62F. It's just below the recommended 64-75F range but it works great and produces a really clean tasting beer with a nice balance of banana/clove flavours. 1.5 qt/lb mash thickness. Single infusion mash at 152F for 90 mins. Mashout to 168F. Cool wort to 62F and aerate well. Ferment at 62F until complete. Some brewers choose not to add kettle finings during the boil (such as Whirlfloc) as the beer is supposed to be cloudy, but the cloudiness of this beer comes from the yeast. We still want to remove proteins, hot break material, and so forth. We recommend, however, that finings prior to packaging not be used (such as unflavoured gelatin) in order to keep as much yeast in suspension as possible. Package as you would normally. This beer should be served at higher than normal carbonation, around 2.5 to 3.5 volumes of C02. I'll often brew a split batch with this beer and do 5 gallons using 12 grams of Fermentis Safale US-05 dry yeast fermented at 68F. This is a very neutral ale yeast and the result will be something more along the lines of an American Wheat Beer. Try it side by side with the Weissbier yeast to see just how much difference the yeast makes. *Wheat malt does not have a husk so the natural filter bed in the Mash/Lauter Tun is greatly reduced as the recipe is 60% wheat. Brewers with systems that are prone to stuck sparges should add rice hulls at a rate of about 20:1 wheat to rice hull ratio to avoid stuck sparges. We do not need to use rice hulls with our electric brewery setup. More information. Have you personally had luck with getting any really really strong banana flavors? That is what i was looking for when I brewed a similar recipe and i couldn't achieve that. I tried to ferment at higher temps around 70 but I just get a hint of banana. I read that under pitching brings the banana flavor out too. Any advice? I don't think you can get really strong banana flavours out of WY3068 yeast (or any other yeast for that matter). It's more about balance. As mentioned above, Jamil Z. gives some good advice on fermentation temperature for Wyeast 3068 from his Brewing Classic Styles book which I follow: Ferment at 62F. What this does is remove a lot of the esters and other flavour bi-products you'll normally get when fermenting at ale temps which in turn helps to not mask the clove/banana. But to get strong banana flavours you just can't get it IMHO. Even Wyeast themselves say that this yeast strain produces a "beautiful and delicate balance of banana esters and clove phenolics". Key word being delicate. Not contradict anything, but I was able to get a really strong banana flavor and aroma using an equal ratio combinaton of White Labs WLP 300 Hefeweizen Ale and White Labs WLP 320 American Hefeweizen, fermented at 62 degrees. Interesting! White Labs selling yeast blends is not new (they have a few blends available), but I've never heard of customers blending their own. What made you want to try this? Just curious! It wasn't by design, but necessity! My local brew shop had 3 vials of the WLP 300 when I first went in, but when I went back to get more, they didn't have any more. They only had WLP 320. Reading the characteristics of both, and talking with them, they have been in the business for about 30 years so I trusted them, I went with the 320. I did 3 vials of each because that is how my brain works. So far, so good! I followed the advice of Jamil on my batch using wyeast 3068. Though I didn't use this recipe exactly, I did end up with a beautiful weisebier that recently took first place in a German styles-only competition. You really want to heed the warning! I had 11 gallons in a15 gallon fermenter... It blew off well over another gallon! And since I did an open fermentation, that naturally ended up all over my Chamber. Oh also, it is really best to under pitch. In that 11 gallon batch I pitched only one smack pack. No starter, just the pack. That yeast is a monster! Should turn out fine as you said. I've never used either but WLP300 is supposed to be similar or identical to WY3068 (both are "famous German yeast used in the production of traditional, authentic wheat beers. It produces the banana and clove nose traditionally associated with German wheat beers and leaves the desired cloudy look of traditional German wheat beers."). WLP320 is supposed to produce less banana and clove notes. I suppose if you're short on WLP300 and don't have time to make a starter, WLP320 would make a lot of sense. I also tried my new Spiedel fermenter as it would hold the entire batch in one container for fewer variables. I tried something new for me also. I never moved or did any transfers of the wort once in the fermenter. I pitched the yeast into this as it was in the chamber, and then when it was time to clarify i just left it all in the same fermenter and crash chilled. I was worried that it wouldnt be clean enough, but it came out like crystal. I am excited about it once it gets carbonated. Will let you know. Being able to do everything in a single vessel because you can drop the slurry/sediment out the bottom is definitely one of the big advantages of conicals. I've done this recipe this week end. It's currently fermenting right now, but I'm wondering when it will be ready to drink? Should I wait a month or two like the lagers? No - Hefe's are best drunk young. Ferment until the gravity hasn't changed for about a week, then carbonate for a week or two and serve. ok, thanks for the information, it's really appreciated. When I did mine, it took about a month including fermentation to carbonation. It did get drunk fast but it improved a bit over the second month. Friends loved it! then it should be ready for summer time! I made this a few week ago. Simple and delicious. I have a Kal clone, no stuck mash, no rice hulls. I built a 3068 starter and it overflowed out of the flask. I ferment in a sanke keg with a brewers hardware conversion kit. This yeast blew out of the sanke keg. I had a ton of slurry in my jug of star san. How would I make this a honey Weiss? Probably by sub'ing out some of the malt or wheat for honey malt? I can't offer any further suggestions given that I've never heard of or made a honey Weiss. Maybe someone else can offer suggestions? 10 days in the fermenter for me. Blow off was crazy...made a 3 gallon starter from two smack packs...put 5.5 gallons in each 7 gallon conical and still had quite the show. Fermented at 62 like suggested...had very strong sulfur odour which has all dissipated now. Gravity dropped like a stone from 1.045 (might be higher than that...used a refractometer for the first time and got variable readings) to 1.015 measured today. Can definitely taste the wheat and it has an almost...delicate lemon flavor for me. Not getting banana but maybe after carbonation? Blowoff tube or huge headspace definitely required (or both)! (Per the warnings from the manufacturer that I reposted up in the recipe). I don't remember if the banana wasn't there right from the start (been a while since I brewed this one) - I wouldn't think that it would come out later (?). Maybe someone who's brewed it recently can chime in.